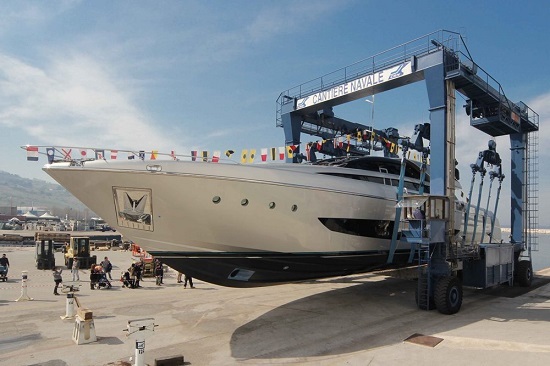 The Riva 122’ Mythos, the new flagship of the Ferretti Group brand, was officially launched in March at the CRN shipyard in Ancona, in the presence of the Group’s top management and of the engineers, architects and designers that have worked on this project for over a year. The ceremony was also attended by the many workers of the Marche-based shipyard – which specializes in the construction of fully-customized mega yachts in steel and aluminum ranging from 40 (132ft.) to 90 meters (300ft) in length – that over the last few months contributed to the creation of this jewel. The 122’ Mythos really marks a turning point in Riva’s heralded history, a brand known all over the world for its legendary wooden motor yachts, the symbols of the Dolce Vita and the icons of a truly unforgettable time. The new yacht is indeed the largest yacht built in the 172-year history of the Italian brand, and the first entirely built in aluminum – a debut that Riva is sharing with CRN, since this is the first time the Ancona-based shipyard is using light alloy only to build a yacht. The 122’ Mythos is also the symbol of the renewed cooperation between these two historical and iconic brands of the Italian boating industry, both belonging to the Ferretti Group. A cooperation that started over 40 years ago, in 1970, when Carlo Riva decided to establish a partnership with CRN. Between 1970 and 1978 the two brands jointly built as many as six 23.50-metre (78 ft.)-long motor yachts in the Marco Polo series and two Vespucci yachts, 90ft. and 100 ft. long, respectively. The new flagship is the outcome of the cooperation between Yacht Designer Mauro Micheli and Sergio Beretta, founders of Officina Italiana Design, the design firm that conceived the entire Riva range and AYT&D – Advanced Yacht Technology & Design, in close cooperation with CRN’s Technical and Interior Design Department for the development of the naval project and the interiors. 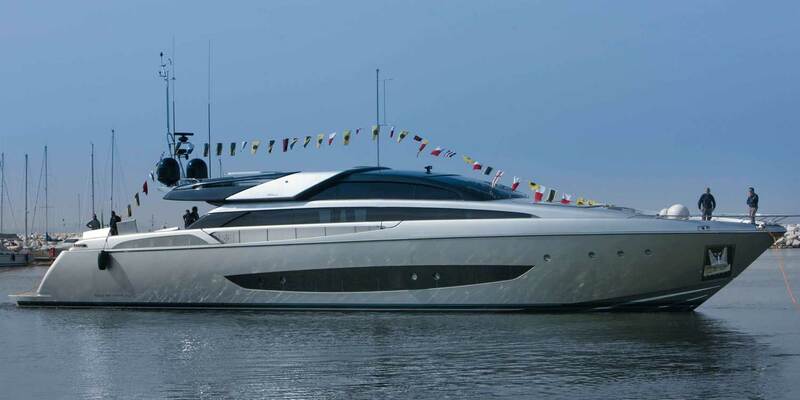 The 122’ Mythos is an evolution of the 86’ Domino, from which it has inherited the main stylistic features. The owner of the first hull has requested the 3-cabin optional version, while the standard version proposed by the shipyard has 4 cabins. An additional optional layout with 5 cabins is also available. The aluminum planning hull can reach a maximum speed of 27.5 knots and a cruising speed of 25 knots thanks to two MTU 12 V 4000 M 93L, 3510 mhp engines (preliminary data). Following the technical launch, a few weeks will be devoted to the completion of onboard outfitting activities, particularly as regards décor solutions and interiors. Technical trials will then be performed. The yacht is expected to be officially delivered to the owner in early May. During the summer months the 122’ Mythos is scheduled to cruise across the Mediterranean Sea and it will be officially presented to the public at the 2014 Festival International de la Plaisance in Cannes. The 122’ will also be presented in Monaco, simultaneous to the Yacht Show, and will then sail off to its final destination, Brazil, its owner’s country. “Today is a very special day for Riva and for all of us at the Ferretti Group as it marks a new chapter in Riva’s prestigious 172 year history” commented Ferruccio Rossi, Ferretti Group’s CEO. “This is indeed for the Mythos the beginning of a path that we believe will be extremely successful. For Riva, in turn, it’s another exciting chapter of a book that we keep writing day after day, feeling great pride and responsibility in doing so. 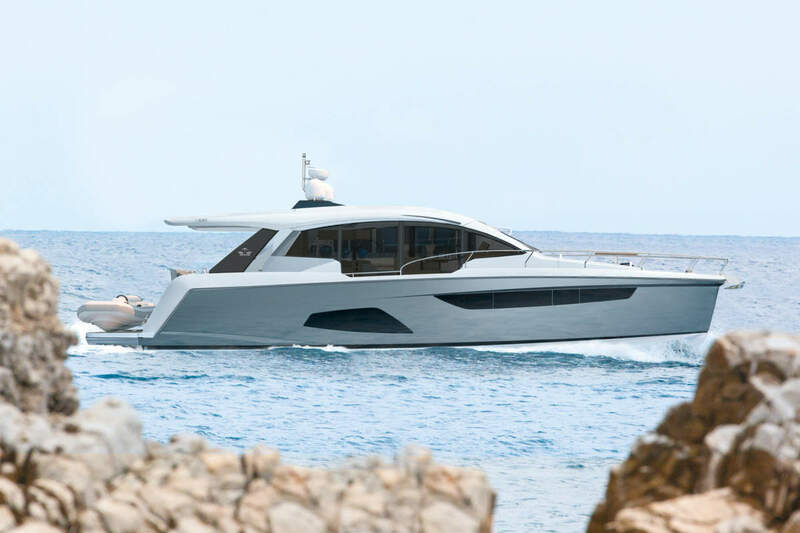 We are sure that the new flagship will be an extraordinary ambassador for Riva, for the Ferretti Group, and for the entire Italian boating industry, as a symbol of industrial know-how and unmistakable Italian beauty. We can’t wait to officially present it to all Riva enthusiasts all over the world,” added Rossi.